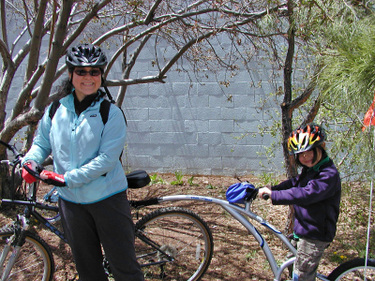 Zhinka dinka doo: Bike to Work Week, day 5!!! Congratulations, that's an impressive amount of biking by my standards. I need to start using mine more, I think the longest round trip I've done so far is a whopping three miles. Congratulations! That is a great achievement - and a lot of miles! Alright! I have that same bike attachment for my boy. We just did a major bikeathon ourselves on Memorial Day along the LA River. Boy, was it a nasty industrial site--but we had fun anyway.